The Beagle™ USB 480 Protocol Analyzer is a low cost, non-intrusive High-speed USB 2.0 bus monitor that includes real-time USB class-level decoding. Not sure which product is right for your needs? The Product Selector Guide provides a brief summary table of key features for each Total Phase product. Detailed technical information about the Beagle USB 480 Protocol Analyzer can be found in the User Manual. Detailed technical information can be found in the datasheet. The Beagle USB 480 Protocol Analyzer has two different capture modes: real-time capture and delayed-download capture. The real-time capture mode allows developers to see all the high-speed data over USB as it happens. As the data is streamed in real-time, the capture size is only limited by the amount of RAM available on the analysis computer. The delayed-download capture can be very useful in certain situations, such as when the Beagle USB 480 Protocol Analyzer is on the same high-speed bus as the target device. In these configurations, the Beagle analyzer is able to consume minimal USB bandwidth so that it does not obscure problems that occur only when the target is operating at the full USB bandwidth. The Beagle USB 480 Protocol Analyzer can capture and display the K and J chirp patterns used in high-speed speed negotiations. The Beagle USB 480 Protocol Analyzer is able to robustly and reliably detect the correct speed of the USB data it is monitoring. A hardware input filter is available to suppress packets in order to reduce the amount of data captured. The filter can remove empty packet pairs such as IN/NAK and PING/NAK pairs. To assist in identifying problems, the Beagle USB 480 Protocol Analyzer provides four digital inputs that allow users to capture additional hardware events in-line with the captured USB data from the target device. Four digital outputs are available to provide for synchronization of the Beagle analyzer with scopes and logic analyzers. These digital outputs are able to match patterns in the captured data as well as idle bus states. The Beagle USB 480 Protocol Analyzer can intelligently detect suspend and resume events as well as unexpected signals on the bus. Get packet-level timing with 16.67 ns resolution. 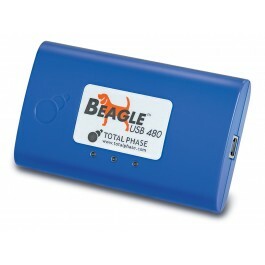 The Beagle USB 480 Protocol Analyzer comes complete with software. Additional discounts are available for larger volumes. Less time wasted because developers do not have to share analyzers or go to the lab to debug simple problems. By saving a day of engineering time, the Beagle USB 480 analyzer will have paid for itself. The Beagle monitor is completely field-upgradable via USB. Total Phase is committed to improving the Beagle USB analyzer and making these improvements available to our customers. You will never have to worry about being out of step with the latest software features. Software and firmware upgrades are always freely available in the Downloads section of this website. How Can I View and Analyze USB Traffic for a Composite High Speed Device? How Can I Best Use a Protocol Analyzer in a USB Port Production Environment to Record USB Data Transfer Speed? How Do I Set Up an Android so the Beagle USB 480 Protocol Analyzer Will Recognize it as the Host? Which Beagle USB Protocol Analyzer Should I Choose to Capture the Data of High Volume Transactions at an Airport? How Do I Capture All the USB Data from a Beagle USB 480 Protocol Analyzer, Including What is Not Visible on the Data Center Software Viewer, and Save It to a File? How Can A Remote Team View and Analyze Captured Data Without a Beagle USB 480 Protocol Analyzer? What Causes the Split Orphaned Packets that the Beagle USB 480 Protocol Analyzer Captures and Detects?